Nitrocarburising differs from Nitriding simply by the addition of the element Carbon (from a suitable carbon containing gas such as Endogas) during the process. The compound layer formed is generally thicker, more corrosion resistant and often takes the form of Epsilon Iron Nitride. One special Nitrocarburising treatment Hauck HT Ltd. provide is the Nitrotec® process from its site in Birmingham. This is a Nitrocarburising plus oxidation treatment to provide superb surface properties to medium carbon steels. Detailed information on Nitrotec® Is found under the treatments section. 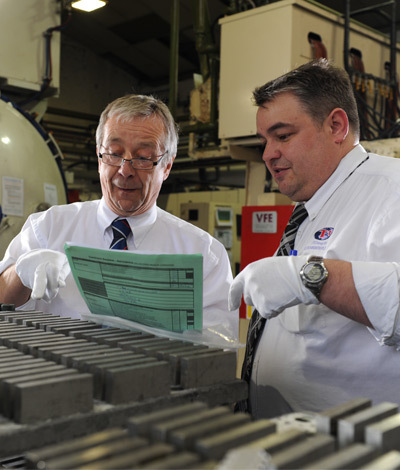 Hauck’s plants in Luton, Letchworth and Blackburn offer the Nitemper process which is carried out in a sealed quench furnace. Short treatment times at around 570°C followed by oil quenching enhances both surface and core properties of most steels. Nitemper is an excellent process providing an increase in surface hardness and wear resistance to steels at low cost. There are many different methods of Nitrocarburising, each offering advantages and benefits over the others. To choose the optimum treatment in terms of properties, and cost for your application please call Hauck HT Ltd. for advice.